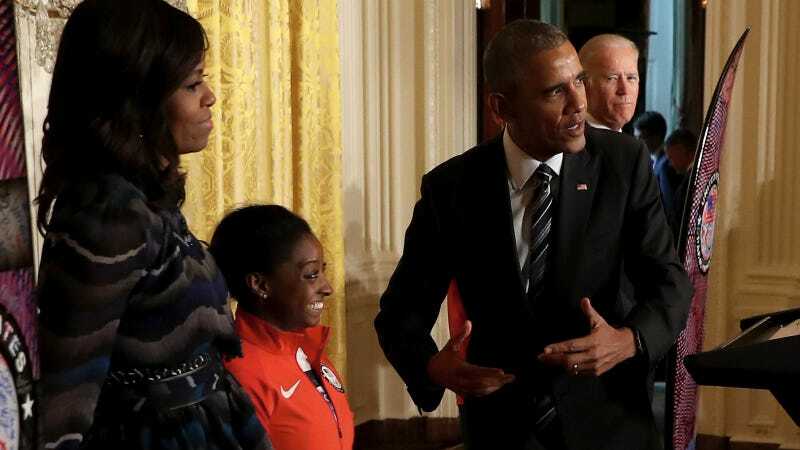 The U.S. Women’s Gymnastics team took their talents to the White House on Thursday and totally geeked out with POTUS and FLOTUS, as one does when there are only but a few months left of our time with them amidst the inferno of this election cycle. Four-fifths of the Final Five—Simone Biles, Aly Raisman, Laurie Hernandez and Madison Kocian—were at the White House as part of an Olympian ceremony (the Obamas’ final one), which also included Michael Phelps and Paralympian athletes from the Rio Olympics. Gabby Douglas was out recovering from wisdom tooth removal, and People reports that national liar Ryan Lochte was “banned” from attending. Looks like he sorely missed out. He also attempted a split with satisfactory effort but poor, ultimately disappointing form. Michelle Obama used the op to point out that POTUS “can’t touch his toes,” which is tragic for a healthy sitting president. Below, video of me at the White House.